Email Sorter | Sky Email Sorter - SkyExtractor.com ! Welcome to Sky Email Sorter. We provide Fast, Exact and Easy Email Sorter software to help you sorting email list by their mail exchanger. You are welcome to download and try, We appreciate your feedback. Support set tag, Import email list, Filter by tag/email/mx exchanger, Remove duplicate emails Automatically. Only one step, importing a mail list file, the software will sort email list by their mx exchanger automatically. 3.Displaying the time used of email sorting. 2.Exporting one email list by one Mail Exchanger. 3.Exporting all email list by all Mail Exchangers at the same time. I am an online wholesaler for baby and children's products. The biggest challenge for me is finding additional retail customers. I found the sky email sorter software by accident. It quickly sorts a mailing list. This software greatly improved the success rate of mail delivery. My business volume increased about 12% since I started email marketing. Thanks Skyextractor.com. 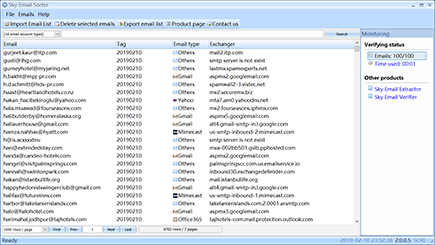 2.Export all email list at the same time.